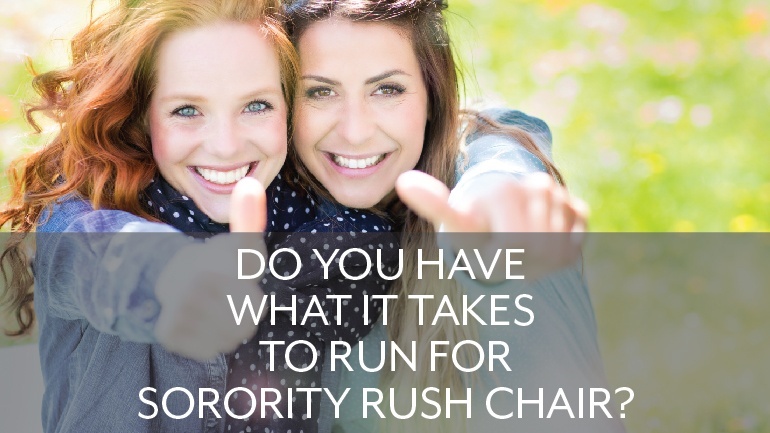 Do You Have What It Takes to Run for Sorority Rush Chair? Forget the winter holidays--sorority rush is the most wonderful time of the year! It’s that point in the semester when you get to meet all of the young freshman women looking for that perfect bid: the sorority world’s version of Willy Wonka’s golden ticket. For these women, it’s an exciting, nearly overwhelming experience. Most are starting their college careers, on their own for the first time as young adults and trying to find their bearings on campus. There are tons of events across the university encouraging them to get involved in the spirit of things. They are meeting their dorm mates, printing out their class schedules and mapping out their route to 8am Comp I. Throw sorority rush on top of that and, well, you get the picture. From your perspective as a sorority sister, you’re excited because you’ve been through it all before, and you’re itching to guide the new kids on the block toward sisterhood greatness. After all, the joy of being in a sorority chapter is something you want to share as much as possible. Your sisters once shared that joy with you, and it’s time to repay the favor now that you’re a chapter veteran. That’s what sorority rush is all about! Every sister gets excited (and a little overworked) preparing and participating in their chapter’s rush, and this is especially true for the sorority rush chair. The rush chair is one of the most crucial pieces in the sorority puzzle. The job is unique in that she must represent the chapter’s core values and act as a public face of the chapter, similar to the sorority president. Yet she does not hold the power of a chapter manager. Her role is one of scrupulous planning, crafting an image and finding the perfect tools to bring new sisters into the fold. It is through her that the chapter finds new vitality and thrives. If you’re considering taking on the responsibility of rush chair, it’s a lot to consider. Your next sorority election is coming up soon, and you want to figure out: Do You Have What It Takes to Run for Sorority Rush Chair? OmegaFi’s here to help you find an answer. Do You Have to Be the Center of Attention? You Might Not Make a Good Rush Chair. Apologies for starting out a little negatively here, but it’s important to clear up one of the big misconceptions about the sorority rush chair position. From the outside, it may look like the rush position is mostly just making a bunch of new friends and showing off how cool you are to potential new members, and it’ll be easy breezy since you’re so outgoing and fun to be around. In reality, that’s a recipe for disaster. If the sorority rush chair is constantly the center of attention, it means potential new members are not. This translates to either their being turned off by your ego and seeking a bid elsewhere, or worse, you not focusing on the crucial information your chapter needs about PNMs to make good recruitment decisions. The lesson here is that being a sorority rush chair balances informing PNMs about your chapter with listening to them so you can both decide whether it’s going to be a good fit. Good Sorority Rush Chairs Don’t Wing It. Brush Up on Rules and Regs. If you aren’t a stickler for the rules, you could get your chapter into a lot of trouble. To determine whether you should run for sorority rush chair, sit down on a night when you can take a break from studying, and really dig into the rules and regulations for sorority rush, both chapter regulations and the national college panhellenic recruitment rules. The fun and games of recruitment events is only a small percentage of what you do as the rush chair for your sorority chapter. Most of the work comes behind the scenes, preparing and coordinating with other chapter officers, committee members and sisters. This requires a thorough understanding of how to navigate the rush process, from planning, to execution of the events, to the final stages of the bidding and recruitment process. One way to help with rush management, and a good indicator that you’d make a good rush chair, is having the foresight to invest in sorority recruitment software. Software can help with everything from event planning, to budgeting and communication, to the bidding process itself. So remember, don’t be the rush chair who wings sorority recruitment, unless you want to crash and burn. In fact, past treasurer experience is a huge plus--although it’s certainly not a requirement. But even if you’ve never served a day in your life as your chapter’s treasurer, it’s crucial that you plan and budget your recruitment like one. While every sister should be fiscally responsible, especially when you’re a chairperson in charge of budgeting out certain activities or purchases for your chapter, this is never truer than with the sorority rush chair. Why? Simply put, you’re matching your investment against the return you get when new sisters come in and contribute membership dues in future semesters. Your position is, by its very nature, a forward thinking one. When deciding what deserves crucial chapter funds and what does not during recruitment, take into account what really matters. Big, flashy musical events and parties sometimes have the opposite effect that you intended, i.e., they attract a lot of potential new members, but they’re loud, you get very little one-on-one time, and what you’re getting out of these events doesn’t add up to what you’re putting in. Think smart. Think efficiency. Sometimes including at least a few simpler, more straightforward events where you can just get to know these young women will cost you less and you’ll get the interactions you need to make smart rush decisions. Should you run for sorority rush chair? If you know you can handle sharing the attention, working hard behind the scenes and budgeting like a pro, then get on up there and give your speech on election night. We’ve got your back. What do you think makes a good sorority rush chair? Tell us who’d get your vote in the comments below.